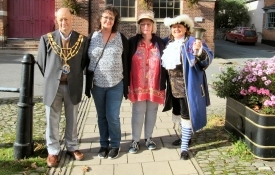 Distant cousins Saran Nanne and Deborah Terrell of Montgomery, Texas USA visited Montgomery on Monday 22nd October and were hosted by Town Crier Susan Blower and Mayor Lionel Weaver. The ladies brought with them 'Montgomery Texas Flag' T shirts which they presented to Sue and Lionel in Broad Street outside the Town Hall. They even had a spare one for Montgomery resident and Community News Team photographer David Wilson. While the photos were being taken, Aylene Harpes from New Zealand, another distant cousin who happened to be passing, asked if she could have her photograph taken with Sue and Lionel as well. 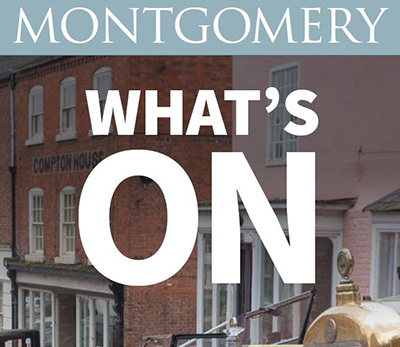 All three visitors were presented with packs of 'Montgomery in the Snow' postcards as mementos of their visit to the town.